Mother's Day Lapbook: What a fun way to learn the history of Mother's Day by creating this Mother's Day Lapbook. I created this Mother's Day Lapbook a few years back, and I thought I would once again put it up to be shared. It basically is the history of Mother's Day, how it came about, by whom and how we celebrate it today. As we come to Mothers’ Day this year, it would be good to learn a little about how the holiday came about. Too often, we take for granted our Mothers, and too often we go through the motions of Mothers’ Day…trying to find the perfect card or gift. Let us pause this Mothers’ Day to truly thank our Mothers for all they are to us, not necessarily what they have done, but who they are as a person. If your Mother has already passed on, in honor of Anna Jarvis, find a Mother who has lost a child and bless her. These can be added to your Mother's Day Lapbook or used as reference. Rose Letter Paper - this rose letter paper can be used to write a letter to mom. 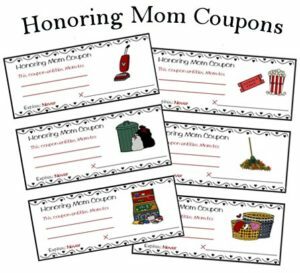 I made these coupons a few years back too, so they reference my old website. I hope you enjoy making this Mother's Day Lapbook. Please let me know if you use it and if you post on your blog, I would love to come see.